The Brush > Samples sub-palette controls how the brush reacts to the mesh surface. When applying brush strokes, information is constantly picked from the canvas and used to update the stroke. If Buildup is turned off, the current brush stroke is ignored while picking the information, until the mouse/pen button is released. If it’s turned on, the information is picked both from the canvas and from changes made by the current brush stroke. When Fast Samples button is on the surface will be evaluated with more accuracy. With this setting off the brushes will act more like they did in ZBrush 3.1. The Constant Samples will keep the Radius Samples at a constant sample rate. When OnSurface button is selected the stroke will be applied along the surface consistently. 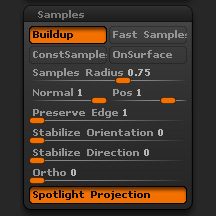 The Sample Radius slider will set the average Normal or Position of the surface based on brush size. For example, if you set the slider to 0.75 then 75% of the brush size will be used when evaluating the surface. The Normal and Position sliders work in conjunction with this slider as well. The Normal slider will set the average Normals to be evaluated under the brush size. If the slider is set to 1 then ZBrush will evaluate all the normals under the brush. If set to 0.5 then only 50% of the Normals will be evaluated. The Position slider will set the average Position to be evaluated under the brush size. If the slider is set to 1 then ZBrush will evaluate all the positions of the surface under the brush. If set to 0.5 then only 50% of the Positions will be evaluated. The Preserve Edge will set the strength for a brush not to smooth out an edge of the surface. This setting is extremely useful when using any of the Polish, Form, and Trim brushes. The Stabilize Direction slider will keep the surface normals stabile to the direction of the stroke. If you take the Clay Tubes brush along the Sphere with the setting at 100 you will see how the surface normal is following the stroke. This will also cause a slower reaction to the surface. The Ortho slider will evaluate the alignment of the brush direction to brush orientation. If the Spotlight Projection button is turned on then Spotlight will use the loaded images as the source to polypaint or sculpt with. The mesh must be directly under the image or no polypainting or sculpting can be done. When the Spotlight Projection button is turned off it will allow you to use all images that are in Spotlight as reference images. The images will have no effect on your sculpting or polypainting.